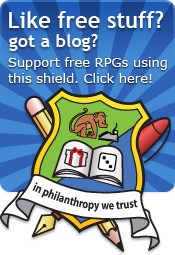 The Free RPG Blog: If you were to have a library of free RPGs, what would it do? If you were to have a library of free RPGs, what would it do? I am leading the community to build a new library for free roleplaying games and I want... no, I need your ideas and feedback. Am I going about this the right way or am I barking up the wrong tree? I do love my free RPGs. You know that by now. I've got a whole bunch of them on a hard drive at home. Most of them serve as a static and yet beautiful digital time capsule from a time when someone had an idea to share. Free RPGs have been shared online since the early usenet days and now there are a lot. 1KM1KT does a modest job of containing 669 of them - and counting. It does a reasonable job too - but it could be better. Browsing and exploring is difficult and search is fine when you know what you're looking for. This is the codename for an idea that's been buzzing around the intertubes for a while: a prupose-built repository for all free RPGs and a spiritual home for their authors. The forum does a wonderful job of supporting the authors but the games themselves need a better home. I believe it needs to be like deviantArt but for free RPGs. I started putting together some concepts and got some great feedback but I want more. Coding wise, I am putting together the framework and domain. There are areas I can get working without too much input - I know there will be a shared login with the forum and that we'll need document upload. While I am getting that sorted, I need more feedback from the community - that's you, dear Reader - about what you would want from it. Whether you're a seasoned philanthropist with 10 games to your name or someone who loves finding them and reading them, I need your feedback. Here are some crayon sketches of what it might look like. On the left is a home screen with the latest games, a featured game and random ones from the archive. On the right is the "Game" screen where you get to add documents, author, description and so on. The orange bits are help bubbles. The brown lines are Felix, my son, who wanted to help. A Document is a file, such as a PDF or Doc. A Document has a unique version. A Product has at least one document. Most will have only one. A Game has at least one product. Core rules, settings and so on. A Document has at least one Author. A Product or Game is authored by all the authors on its documents. A Document has a moderation state. (This is only to avoid spammers). That's the core of the model and I think it serves as a starting point. You could add another layer such as a publisher, which is a collection of Games (such as Stargazer Games) but that will come later. This is the bit that you either understand or it's me saying "blah blah blah" - don't worry, it'll only help anyone thinking about volunteering! I will probably end up coding the majority myself but I will be giving out the system to the community by hosting it on GitHub. Coded in PHP with MySQL database, it will be built on the Symfony 2 framework (which has Doctrine 2 for ORM and database Migrations). It also has Twig templating, which is a well featured template engine. All the styling will start with Twitter's Bootstrap, which I will override later to create the site theme. Now it's time for your brain! What do you think it should do? Are there any killer features you think it needs? All ideas great and small are warmly welcome. I know comments are a bit low-fi for some opinions, so feel free to blog it, pop to 1KM1KT, G+ or send me an email on brainwiped@gmail.com. Please do not assume I would have thought of something. There are implementation details I've not included here, so you might find me saying "Thank you, yes, we'll do that!". That would be cool, it means we're all thinking along the same lines. No idea is too stupid. Alright, some ideas are too stupid but I'm really nice to people who babble madness! Now's your chance to make a big difference. It's all about the search, you need to be able to search, on names, people, tags, categories etc etc etc. p.s. your capture on comments entry is a pain, really hard to read. As a purveyor of at least one free RPG (Heroes Against Darkness), I get lot of hits to my blog from http://www.homebrew.net/games/. So the important thing to me is visibility. Eventually HAD will fall off the top of homebrew.net, as it's fallen from the top of 1KMT, and then a huge number of my hits will disappear entirely. - Ratings (so that people looking for games can get an indication of the quality thereof). - Tags (as already mentioned, for genre, system, etc). - Forums for each game? This could be useful so that the game's authors don't have to set up individual forums which are hard to maintain with a small userbase. - Track number of downloads. - Reviews. Ability for registered users to post reviews of the games. - Branding. Ability to post logos and cover pages for the games. - Link back to the game's homepage. Just a quick question on how the users themselves would be able to log in and check out their stuff. I mean, as of right now it's been you wonderful monkeys uploading things to 1km1kt, but to lighten that burden how do *I* do it? @Annonymous - thank you for the feedback. Search is very important! I'll make sure that the capture is better. Captchas are getting more and more a pain - logging into Blogger is a nightmare! Forums for each game - there is nothing worse than a dead forum but what will happen is forum integration so that posts that concern a game are linked together. Then you can see discussion from the forum. Link backs - Yep, although the file will need to be hosted on the server. A game without documents won't be listed. @Jon - Right now, you submit the game to 1km1kt (which arrives by email) and the mods (well, misterecho) turn it into a Wordpress post. As a trusted member of the community, you'd be able to upload and manage your own files without moderation. Those who we trust yet will need moderation - for which there will be a quick and easy queue for the mods. The DeviantArt comparison you made is interesting. I think that site does a great job of presentation and of featuring impressive pieces. I think it's a horrible mess in terms of navigation, though it doesn't seem that way until you try to use it. Things are organized in such a way that I wasn't sure what category half my stuff belonged in, and there's no way to find (for instance) all sci-fi art rather than sci-fi paintings, sci-fi drawings, and sci-fi digital art all separately. I have no idea what the difference is between Emotive and Expressive portraits, and I can only view one of those category at a time. I would be really interested to see a section that was full of CC or public domain resources (both text and art) that could be dropped into other games. Someone might have a really nice writeup of their open core rules, for example. I don't know whether you want to do donation links, but I could see folks being interested in that. I'll second anonymous. Good search is essential to find what you want out of the hundreds (thousands?) of free games out there. I don't think user contributed numerical rankings should be included. First of all - a person's relation to a game is very subjective. Secondly, its very hard to make a fair comparison of rankings across such a vast collection. A lot of the games on 1km1kt.net are contest entries, first attempts, 24 hour games, or just old and simple. Comments would be great, but rankings would be an apples to oranges situation and not helpful. A staff picks page or top downloads list might be the better option. Notes on system might be nice, but will take a lot of reading, rather than simply reorganizing. We would need to create a universal description of game complexity to be able to tag that. Thank You for all the effort you're putting into the new system. 2) Browse by category. "Computer, show me rules-light narrative hard sci-fi." 3) When I find a game I'm interested in, I can go directly to a forum about that game, in case I have questions about it or am curious what people are doing with it. 4) I subscribe to the site's RSS feed to get notification of new games. Rob, I think it's a great idea. I see there being two main uses for this hypothetical site and I think they are equally important. The first use is the site as a repository of free RPGs. It needs to be well indexed and easily searched, which means that you need a set of tags rather than a free for all. I'm imagining something like the way RPG Geek categorizes things by genre and game mechanics. It would be nice if there was a way to connect games together as well. If you visited the Apocalypse World page (I know it isn't free, but this is to illustrate the point) it would have connections to Dungeon World, Monster Hearts and a number of other games. A feature like this would allow people searching to find supplemental material or adaptations and help foster a community. The second use would be as a gallery/host for various game designers. Right now I put my games up on GoogleDocs and link them from my blog. If instead I could open up a page that attractively displayed my games with cover, blurb and whatnot then I would just link there. Turns out I lied, there are actually three uses for a site like this. The last one? Collaboration and free rpg community building. If I can build a gallery then why not also have a designer profile? Maybe I can "follow" a specific game I liked so that I got updates when it is changed? My follow list could be public so that someone that liked my games might check out the games that I like. Maybe there is this guy called Rob Lang that is some kind of authority on free RPGs and I want to keep an eye on his follow list because he has such good taste (as if someone like this actually exists). Another feature in this same vein might be able to mark games as finished/published and work in progress. A WIP game doesn't appear in the main archive/search, but it allows designers to encourage each other, post their drafts and so on. When it is finished they click "publish" and it appears in the main search. Put a checkbox in search that allows people to search through WIP games, if they dare. The website would need a number of feeds on the front page. Recently updated/added games, recent ratings, recent discussion (if each game has a comment/discussion section, anyway). It should also display games in some way, perhaps randomly? Maybe several random games with ratings above a certain threshold? I think it would also be a good idea to have a clear license associated with each game. Let designers select from CC, OGL, PD, GNU (maybe) and possibly custom. I have one RPG under my belt (Yes, But...), so a place to host it would be cool, but I'm mostly interested in exploring others' ideas. When I'm flipping through rpggeek.com, the most useful to me is the ability to browse by genres, systems, settings and mechanics. Solid list of mechanics is a must. It would be supercool if the author could denote games which are not necessarily in database (i.e. commercial ones), which influenced his game. This way you could easily find all games inspired, by your favorite commercial game, because you'll probably like them too. As for reviews, I really like the idea of gamespot's standardized game emblems (to the right of the review, for example, here http://www.gamespot.com/dark-souls/reviews/dark-souls-review-6337621/) - good and bad alike, they are succinct and readable. @Colin - dA nav is a nightmare, granted. I don't think we'll extend the system towards resources for games - there are plenty of those elsewhere. I like the idea of there being donation links! @George - Search - affirm. Tag system - absolutely. A mix of system ones and folksonomy. When we come to make the tags, I'll start with ones I used in the links directory and we'll bolster as needed. @Chainsaw - Point well made on numerical ratings. How about a Like button? Staff pics - affirm. That's what the Featured feature is for. Someone mentioned user lists - which is also a good idea. System notes - a big big ask. Which would be asked of you. It's one thing to tag 669 but analyse every system... hmmmm... too much. @Anon #2 - Thanks for your slightly different tack! 1. If you're registered, you can keep a list of faves. 2. Browsing - affirm. 3. Forum linking - affirm. 4. RSS - affirm. 5. One-click - I am looking into creating a torrent. @The Boulder - Thank you! 1. Indexed/searched, system tags and folksonomy - affirm. Linking games - I like it! Supplements would be all part of a 'game'. 2. Home for Authors. Yes. Definitely. How far we go with this will depend on what take up there is. I'm all about giving the philanthropist authors a home. 3(!). Having favourite games and following games has been mentioned in a number of guises, so will need to go in. Associated games would come later - like amazons "Users who download this game, also downloaded...". 4(!) WIP marking - excellent idea. Probably by tag and should be included in search but marked clearly as such. 5(!). Feeds - affirm. 6(!). The front page will pick latest, featured and random games. 7(!). @Random_Phobosis - Every free RPG is well received! Browsing will be there - what do you mean by a 'solid list of mechanics'? There are shy of 700 games with mechanics that are not easily categorised. I like the idea of influences, that might be good for the game description. We are not going to numerically judge games, instead we'll be using "like" buttons. If the proposed site is to become a genuine home for free RPGs on the net, then it absolutely needs to allow registered users to rate the games on a numerical scale, otherwise it's just going to turn into another repository of free RPGs, but with better searching. We already have 1KM1KT, we have The Free RPG Compendium (homebrew.net). And neither of these satisfactorily collects, collates, compares and promotes these RPGs because they don't make any distinction in quality. We need to make a site where people can come and find the best we have to offer, not just find any thing that matches their particular search criteria. If you're worried about particular types of RPGs not being able to be fairly rated, then give each a caregory like 'Complete' or 'Prototype' and only allow ratings on Complete games. >what do you mean by a 'solid list of mechanics'? There are shy of 700 games with mechanics that are not easily categorised. It is a lot of work, but if experienced roleplayers come up with a list of mechanics first, maybe authors of most games could categorize their games themselves. Anyway, when I want to include, say, auction mechanic in my game, this feature on RPGG allows me to quickly familiarize myself with other uses of this mechanic. It's useful, but maybe it isn't worth the hassle. My main point is it would be cool to make them searchable. I'd like to see some kind of visibility mechanism, where good games are consistently on top, and in my opinion simple numerical ratings are more transparent and reliable than stuff like "featured" and "game of the week" and such. Sure, there could be separate ratings for complete games, contest entries and prototypes. I don't like numerical ratings on games. A "Like" button will be enough to distinguish between those games people enjoy and not. If a game has a lot of "likes" then it's worth looking at. How do you compare two RPGs? It's not a simple thing to do. How does HAD rate against Icar... or Emmett's The Artefact? Or Dog Town? Or Eclipse Phase? Certainly, we know that a lot of people like our games but as soon as you perform a numerical comparison, you're in hot water. What makes an RPG good? Layout? Good language? Pictures? Full colour imagery? Or is it... originality? Icar and HAD aren't original. Someone would rightly score us poorly on that. Does that make the game bad? No. Not if people like it. Scoring guideliness won't help because you can't be sure they're obeyed. Every year the mods at 1km1kt and I sit down to judge free RPGs against a set of criteria and we manage just about to pick top three. We don't assign scores because they're too subjective. Scoring is useful when you can average thousands of them. We're not going to get thousands of them. "Like" is good because it doesn't mean that one is better than another. All it means is that X people like it. That's useful in itself. HAD might have more "Likes" than Icar. That's OK, doesn't mean it's better - just means that more people have hit the "Like" button. It suffers from the same problems of marketing-charm-offensives skewing the numbers but it does allow the more popular games to bubble to the top. Notice that I say more popular and not better. Imagine a new author of 14 uploading their first RPG, which is a clone with self-drawn images and poor English. It's complete to the author, they've sweated over it more than any school project. From the first registered reviewer it gets 2/10. Compared to HAD, Icar or the other big games, it is fair and transparent that it gets a 2/10 but it's not going to help that author, just demoralise them. For each and every "Like" they get, it builds their confidence to do more. No "Likes" is not 0/10, it's just that no-one's clicked the button yet. My example is not a limit case. You could then argue that scores only appear when there have been X ratings and that there are constraints on ratings (such as you must have played it - how might you track that?) but I think that diminishes transparency and is fixing the symptom not the problem. Games with lots of Likes will bubble to the top so we will see what people are enjoying. That will be enough. Ah, I see! We can try and tag mechanics. Might be tricky. Not a feature we'll put in at first but I see that it's a good idea and really nicely implemented by RPGGeek. Sadly, ratings aren't transparent. As statistics go, they only become useful in their thousands. We're not going to get thousands. See my comment above. Sorry to direct away from this comment thread, but I really did ramble a lot. The thing I use a lot on BGG are subscriptions. It's very nice to receive notifications about updates and/or new discussions for your favorite games. It's even nicer to be able to filter what kind of notifications do you want to receive (for example, notify about reviews, but not rules questions). Alright, be warned that a lot of my comment is going to be features stolen from fellow commentators that I think are important. I, at least, would like to have genre categories. Let me know what kind of system we're using. (Not the most important, but if we're using d20 OGL, that's a good thing to know. If we're not using dice at all, that's another good thing to know!) Let me know how rules-heavy or rules-lite it is. Let me know what it's akin to. (If I liked The Cursed/Heroes Against Darkness/Pathfinder/etc., would I like this?) In short, I need the information to decide if it's a game that's right for my current players. This isn't a set in stone thing, but it was an idea. Perhaps if you had where I could hover over the rpg in question and get some quick information about it? Again, all the complexity, a short entry about the game, that kind of thing. If I, by chance, know the name of the game that I'm looking for, I need to be able to find it. Quickly. If there's a new game, I want to hear about it. Perhaps, following the DA example (which I'm a huge fan of that site, by the by), you could "watch" different rpg creators. That way, at the very least, you could be informed of any changes they've made to their game(s). While I generally ignore ratings (so many good games stay unrated), I do like to tip my proverbial hat to the creators, in one way or another. Or maybe an 'add to collection' type thing? I don't know. I'm just rambling. Really, really like a game creator? To the point that you make him/her an NPC? Donate to them! I don't know about the rest of you lovely people, but generally, I need playtesters. Particularly ones that have played rpgs before. Heck, maybe there could be a nice forum for this. Then game creators could get feedback to help their little creations along before they're released to play with "the big fish". This has nothing to do with the rating system I was trying to figure out above. That's why I gave it its own little spot. Okay, so I love a game. I love a game so much that I constantly try to convince my hard-headed players to give it a chance. But they won't budge. I need a place to save it until they are willing to try it. Or, say, it gets deleted and I can remember "that one game that was really awesome and had x", but the name of it escapes me? No problem! I have it in my collection! Thanks for the additional ideas everyone. Sorry for the slow reply but work went mad! I will be getting a framework up and running that we can build features onto. This is something that I've always thought would be cool to do, but I've never had the time or computer skills. Good stuff! Firstly, I think it should be comprehensive. I know I've come across a jillion free RPGs in my own limited experience. Having them all on one, easily accessible, website would be very cool. I know it's impossible to have them 'all' but nearly all of them would be great. I've always loved the existing website for free RPGs even if it might not have them all. The little kernel descriptions of the games are great. Secondly, I think some form of referencing or searching through games would be very helpful. When you have a ton of games you may or may not be interested in, it's kind of hit and miss. Some way to get a good 'feel' for the games with brief descriptions or player comments would be awesome. Links to more information would be great too, kind of like Wiki pages. Thirdly, as a guy who creates RPGs myself, mainly I'd just want my own games front and center with the bold words 'get this' but I know that's unrealistic and weird. I guess I'd settle for a fair judgement or equal treatment kind of thing in that regards. Thanks for putting in the work to do this. I think it's a great idea! Also, thanks for the mention of my game on your site. I really appreciate it. If you have any ideas about the system (or how to improve it) feel free to let me know. I'm always trying to make it better and I'm not one of those crazy authors who will get mad at you if you say my game is crappy or needs serious fixing/changes. Thanks for the feedback, David. I'm glad you like it. I've just completed 'File Upload' section of the code, so it's making some progress. Great. Hope to see it in action some time soon! I know these things tend to take a little time. While I think RPGGeek is VERY weak in being able to search RPGs, it does almost everything else 'right enough' that I think it has much better chance of promoting free RPG's than building 'yet another site for storing free RPGs'.